Missing teeth can be a nuisance, both cosmetically and functionally; you may feel self-conscious about a gap in your smile, and that gap will almost certainly cause problems with biting and chewing. While there are several procedures dentists use to fill in gaps left by missing teeth, dental implants are by far the most natural-seeming in form and function. A dental implant is nearly indistinguishable from a natural tooth and can last a lifetime with proper maintenance. All American Smile Dental Studios is pleased to provide dental implants for patients in Manhattan, Brooklyn, Borough Park, Sheepshead Bay, Prospect Park, and throughout the New York City area. Dental implants are synthetic teeth that are attached to the jawbone, in much the same way that actual teeth are anchored. 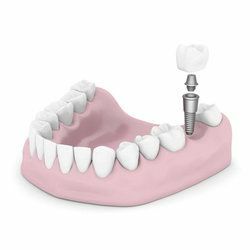 A dental implant consists of two basic parts – a metal anchor and a porcelain crown. The anchor is firmly implanted into the bone of the jaw, and then the crown, a restoration that appears identical to a normal tooth, is attached to the anchor. Bone and gums grow in around the implant. Since the resulting restoration is sturdy, durable, and natural-looking, we highly recommend dental implants. Contact Maurice Benjamin, DDS, in Manhattan or Brooklyn to schedule a consultation and determine if implants are for you. Dr. Benjamin's expertise with dental implants, the most advanced and realistic tooth replacements available, results in beautiful smiles for patients at his Brooklyn and Manhattan practices. Are dental implants hard to place? Placing dental implants requires a specialized set of skills. Many dentists will "restore" dental implants, which means that they will attach the porcelain crown, but only after referring you out to a periodontist or oral surgeon who will place the implant into the jawbone. This can be very time-consuming, requiring several visits, often to different office locations. Dr. Maurice Benjamin, however, is a highly-skilled implant dentist, trained in the surgical placement of dental implants. This distinguishes him among other dentists in Manhattan, Brooklyn, and throughout New York City who have to refer patients for oral surgery. Instead, Dr. Benjamin can place the implant, as well as fabricate the crown, without the need to send you out to different offices. When you come to All American Smile Dental Studios for a dental implant, we will most likely be able to place the implant, attach the crown, and have you out and smiling in the same day. The cost of a dental implant is roughly equivalent to the cost of a fixed dental bridge, the older method of replacing a tooth. And, as dental implants have a much more natural look and feel than bridges, they provide excellent value for the investment. If you need to have one or more teeth replaced, dental implants may be the best solution. To determine if you are a candidate for dental implants, contact Maurice Benjamin, DDS at our Manhattan or Brooklyn offices to schedule a consultation. All American Smile Dental Studios welcomes patients from throughout the New York City area, including the surrounding states of New Jersey, Pennsylvania, and Connecticut, as well as international guests, to contact us.